Many people may be offended at the thought of laughing with/at/during cancer, but for those of us who actually have cancer..sometimes, you just need to laugh. Life is full of laughter and tears. Having cancer doesn’t cause life to happen in a vacuum. There are so many days filled with tears, stress and worry; at some point you wonder if there will ever be joy. And, that is where God stepped in for me. He has given me a “Humor Angel”. This wonderful angel doesn’t live in the same town, or even the same state. She doesn’t even know me as an adult, but she remembers me as a small child. I’m sure those memories consist of me being rebellious, stubborn, hard-headed and throwing temper tantrums. Nonetheless, she has been faithful to send me cards regularly. And, for reasons I don’t know, she ‘gets’ the fact that I need to laugh. 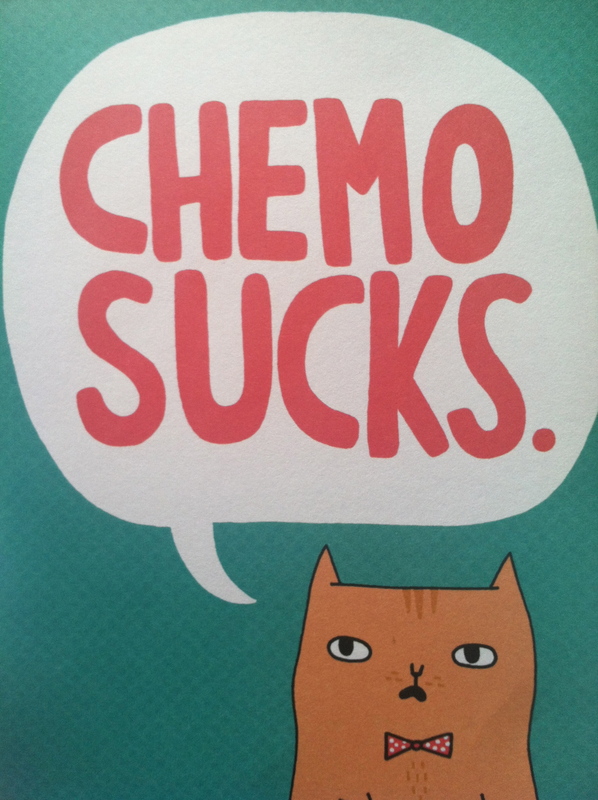 She has obviously found the “Cancer/Humor” section of her local card store. And, who knew such a thing even existed? 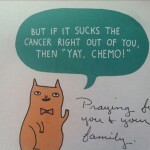 I mean, isn’t it a bold move to send a cancer patient a funny card…you never know how they will react. Well, I can tell you it has been worth it! From the first card she sent, I have literally laughed out loud when I open her cards! (not that LOL you type on FB, but you aren’t really LOL’ing…I really LOL’d!) When I see the envelope from this angel in my mailbox I smile and think “What has she found now”! After the week I have had, I needed to laugh and cheer about something. 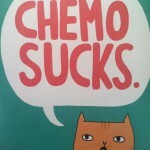 Well, there you have it…”Yay, Chemo”! Too funny. Proverbs 17:22 says: “A merry heart does good, like medicine, But a broken spirit dries the bones.” Solomon was indeed wise. My demeanor shifted and my heart felt lighter. There is so much that I can worry about, but so much that I can laugh about too. And, just like this next card, I guess I have no complaints! Your laugh makes all that are around you laugh too! I love it!Keep it up.Love you mom adams. So glad that you have been able to laugh. Keep it up. Laughter is the 2nd best medicine….God being the 1st of course. So glad you can still see the joy in life and feel the love that people have for you! Steph – I thought you said your angel didn’t know you as an adult. From your description, I think she DOES know you as an adult. LOL (Just kidding). We pray for you daily and know that God’s love and grace will sustain you as you travel along this journey. We love you. Keep laughing and when I get back, I’ll see if I can help you out a little on that front. Love you much. Yes Cathy you are a “Long Distance Angel”. She waits and calls and we laugh about how you know just the right time to show up. I love you for it. Anything to make my daughter have a better day is good for me too. Luv u.
I am not there pyhsically bit I am there in spirit cheering you on.